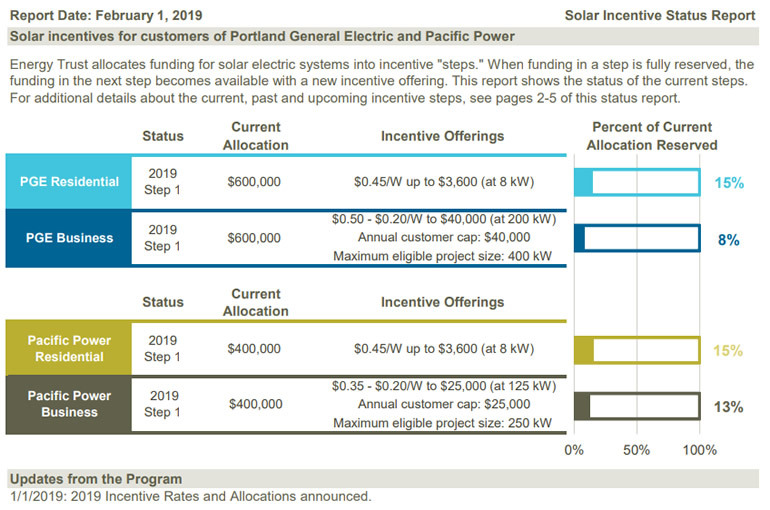 Federal Energy Tax Credit: Covers 30 percent of the cost of a solar electric system installed by December 31, 2019. Energy Trust incentive, your trade ally will also complete your application for an Oregon Residential Energy Tax Credit. View the requirements. Contact the RETC Team: 503-378-4040 OR 800-221-8035, Email: askRETC@oregon.gov OR visit State Website for addition tax incentive explanations. Incentives are subject to change, please check for most current rates at the above link. Lower your upfront project costs and start saving energy sooner with incentives and affordable financing repaid on your energy bill. Energy Trust works with local non-profit lender Craft3 (NMLS ID#390159) to provide an on-bill repayment option and preferred rates for energy-efficiency improvements that qualify for Energy Trust incentives. Lower your upfront project costs and start saving energy sooner with incentives and affordable financing repaid on your energy bill. Energy Trust works with local non-profit lender Craft3 (NMLS ID#390159) to provide an on-bill repayment option and preferred rates for energy-efficiency improvements that qualify for Energy Trust incentives. Enhabit offers Energy Trust cash incentives as part of a comprehensive package of rebates to reduce your upfront and total project costs. Enhabit’s network of financial lenders provides a wide variety of loan options—including zero-money down financing and on-bill financing—for improving the performance, comfort, efficiency, health and safety of your home within your budget. Over 10,000 homeowners across Oregon are making their own solar power. Join them in taking control of your energy costs—and improving your home’s value—with clean, renewable energy from the sun. Some financing options may be dependent on the location of your home, income level, utility providers or other factors. Kelly Moore & Ian Sigmund (503) 227-1262, KelliMoore@UmpquaBank.com. McKenzie River Trust – Partnership. All new installations Solar Ki, LLC will donate $250.00 to McKenzie River Trust.